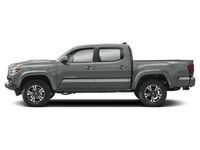 Power, toughness, a bold style, an athletic performance and an affordable price tag are highlights of the 2019 Toyota Tacoma platform that have made the Toyota midsize pickup truck a fan favorite at Downeast Toyota. Toyota Tacoma entries are available in six trim levels – SR, SR5, TRD Sport, TRD Off-Road, Limited and TRD Pro – which can make the decision difficult for many car shoppers. Take a closer look at a few favorites with this 2019 Toyota Tacoma SR vs 2019 Toyota Tacoma SR5 vs 2019 Toyota Tacoma Limited trim level comparison. 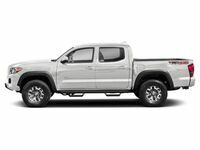 When you choose the 2019 Toyota Tacoma, you will have a choice of two body styles – Access Cab and Double Cab – that can be paired with a 6.1-foot standard bed or a 5-foot short bed. Tacoma SR and Tacoma SR5 trim levels come standard with a 159-horsepower 2.7-liter four-cylinder engine that pairs with a six-speed manual or a six-speed automatic transmission to earn 23 mpg on the highway. A 278-horsepower 3.5-liter V-6 engine is available for Tacoma SR and Tacoma SR5 entries and is standard in the top-of-the-line Tacoma Limited trim. 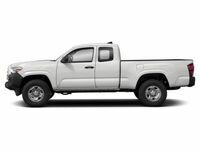 When properly equipped, the 3.5-liter Toyota Tacoma will tow up to 6,800 pounds of cargo. Are you looking for a capable and affordable midsize pickup truck? Look no further than the 2019 Toyota Tacoma. 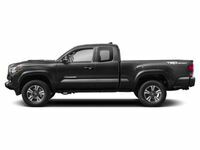 Armed with this 2019 Toyota Tacoma SR vs 2019 Toyota Tacoma SR5 vs 2019 Toyota Tacoma Limited trim level comparison, you will have the chance to take a closer look at popular trim levels and find the right fit at Downeast Toyota. Toyota Tacoma SR models are the most affordable in the lineup with a price that starts at $25,550 and still promises a wealth of standard features. Toyota Safety Sense™ comes standard with a Pre-Collision System with Pedestrian Detection, Lane Departure Alert with a Sway Warning System, Automatic High Beams and Dynamic Radar Cruise Control to upgrade safety. A 6.1-inch Toyota Entune™ Audio touchscreen infotainment system is a highlight of the Tacoma SR with a rearview camera, Siri® Eyes Free and Bluetooth. Highlights of the Tacoma SR options list include a blacked-out SX Package, the SR Convenience Package and much more. The next trim level up in the Toyota Tacoma model lineup is perhaps the most popular with an impressive combination of high-end features and an affordable price that starts at $27,325. Upgrades to the Tacoma SR5 spec sheet include a more advanced 6.1-inch Toyota Entune™ Plus infotainment system with Scout® GPS Link Connected Navigation technology. When you choose the Toyota Tacoma SR5, the highlights will include projector beam headlights, a Charcoal grille with chrome surround, 16-inch wheels, a leather-trimmed steering wheel, remote keyless entry and more. Add a little luxury to your day-to-day drive when you upgrade to the 2019 Toyota Tacoma Limited. With a price tag that starts at $37,490, the Tacoma Limited pulls out all the stops. A 7-inch Entune™ Premium Audio interface takes center stage and will feature Integrated Navigation and a JBL® sound system. Elements of the Toyota Tacoma Limited resumé that will upgrade your drive include premium leather upholstery, LED running lights, a power moonroof, 18-inch alloy wheels, heated front seats, a Qi wireless charging system, Toyota Smart Key with push-button start and more.